Beatriz (SALMA HAYEK), an immigrant from a poor Mexican town, draws upon her innate kindness as a spiritual health practitioner in L.A. Doug Strutt (JOHN LITHGOW) is a rich and ruthless real-estate developer. When fate brings them together at a dinner party, it leads to a culture clash of wildly comic proportions — and a night that will change both their worlds forever. This release comes with a matted slip cover. The only feature included is the Theatrical Trailer. Yawn. Beatriz at Dinner is presented in its original 1.85 widescreen anamorphic aspect ratio and comes with a basic but adequate Dolby Digital 5.1 track where dialogue comes through nicely enough. 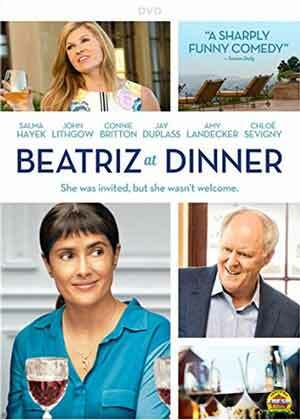 Overall, Beatriz at Dinner excels more on the performances by Salma Hayek and John Lithgow rather than the plot or screenplay writing or even any genuine laughs, as this is more drama than comedy, but still recommended as a whole. The DVD isn’t anything noteworthy with good video and audio transfers and only a trailer in the features.